Sony may have won E3, but AMD managed to impress gamers this week as well with its new 5GHz FX-9590 CPU. Yes, that's 5GHz, making the 9590 the fastest consumer-grade processor ever produced. With its chips powering all three next-gen game consoles - the Xbox One, PlayStation 4 and Wii U - AMD has been on a roll for some time, and the company wanted to take the opportunity at E3 2013 this week to unveil its latest one-upper. But how did AMD achieve the 5GHz benchmark, and where does it see gaming going over the next generation? TechRadar sat down with two of the chip maker's marketing managers, Robert Hallock and Marc Diana, to find out. Hallock and Diana said that AMD has been working toward the 5GHz processor for a long time, and that it was simply a matter of progress. "We have been constantly optimizing all of our architecture," Diana said. "Process improvements. Things get better. You learn, you make adjustments. It's like tweaking and tuning an engine." The eight-core FX-9590 will debut in desktop PCs this summer and a standalone version is always a possibility. But the behemoth has some drawbacks; it probably won't come cheap, for one thing, and at 220 Watts it draws a significant amount of power. But "you don't buy a ferrari because of the MPG," Diana said. "It's made to do one thing, and that's go really, really fast." He added that expert PC builders have pushed previous AMD FX chips to 5GHz using overclocking and advanced cooling techniques, but AMD wanted the FX-9590 to go there out of the box. "The 5GHz barrier has always been a goal for us," Diana said. On the E3 show floor AMD showed off an impractical but intriguing five-display setup that managed to simulate in-game peripheral vision in Tomb Raider, as well as Vizio tablets running Windows 8 and notebooks streaming Devil May Cry at over 30FPS with low latency using CiiNow. In the mobile space, AMD focuses on graphics, Diana said. 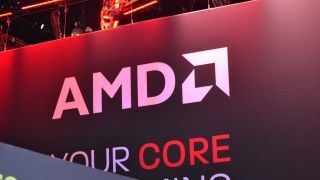 He and Hallock pointed to its E3 offerings as examples of what AMD has been able to accomplish in that area. "Our strategy on the tablet side has always been to basically dominate on graphics," Diana said. "We've taken tablet performance from tailored operating systems with a really limited environment, to now you're playing Battlefield in a span of 18 months," Hallock added. AMD is certainly pleased with itself for the strides it's made in gaming, but competitor Nvidia seemed less so in an interview with The Verge. Nvidia Senior Vice President Tony Tamasi suggested its chips are still better, saying that at least the new consoles with AMD's GPUs will "raise the bar." We asked AMD about that statement, and Hallock and Diana took it in stride. "Yes, having consoles use AMD Radeon graphics will raise the overall graphics quality in the industry," Hallock said. "When you put [our custom-built APUs] in a system, when you give consoles real, legitimate high end hardware for the first time, yes, the overall quality of games will go up, just by the sheer fact that you're giving developers bigger, more powerful tools to work with." But he said that the unification of technology across systems is even more important, as it will allow console games to be more easily ported to PCs that use AMD's chips. In fact, Hallock and Diana prefer not even to use the word "port" anymore. "I don't even like the word port because it does an injustice to the developers who spend time and effort making really good PC versions, like Tomb Raider and BioShock," Hallock said. And with the new consoles, "the resources [developers] are working with on the console are the same resources they're working with on the PC, so they don't have to turn any knobs backward anymore." So if it's not a port, what is it? "I don't know what the word for it is either," Diana said, "but you know what? I'm goddamned excited to play it on a PC."